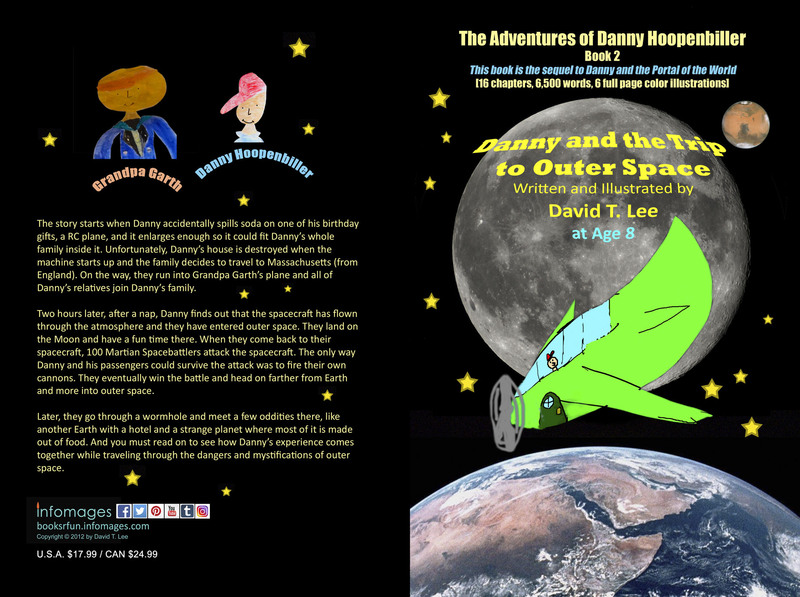 Danny Hoopenbiller, the titular character, is an ingenious young inventor. 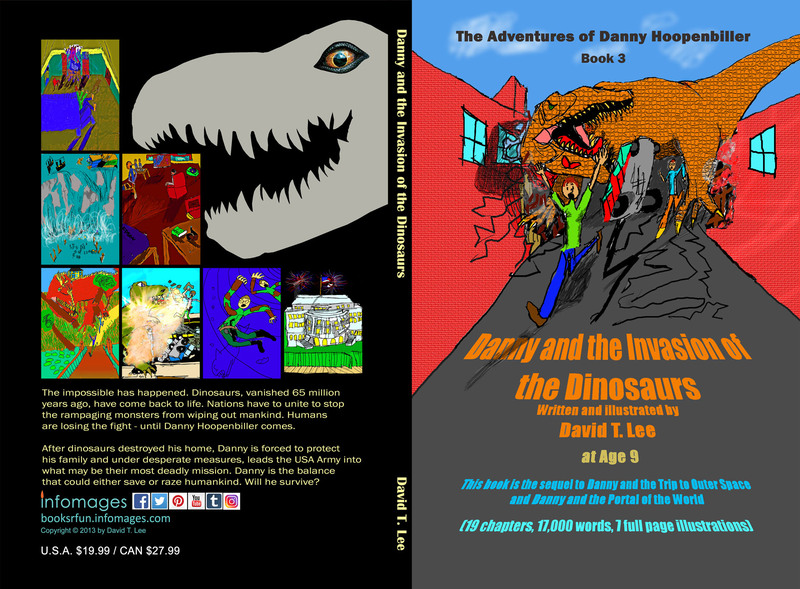 The 5-book series chronicles Danny’s ridiculous inventions and heart-pounding adventures. His exploits take him through a diverse group of locations, from Earthly places like New York and Yucatan, Mexico to interstellar settings such as Foodland the Planet Seventh! Whether Danny’s fighting for the future of the human race or aiming to get back home after a portal mishap, he always manages to throw in a bit of humor as well. 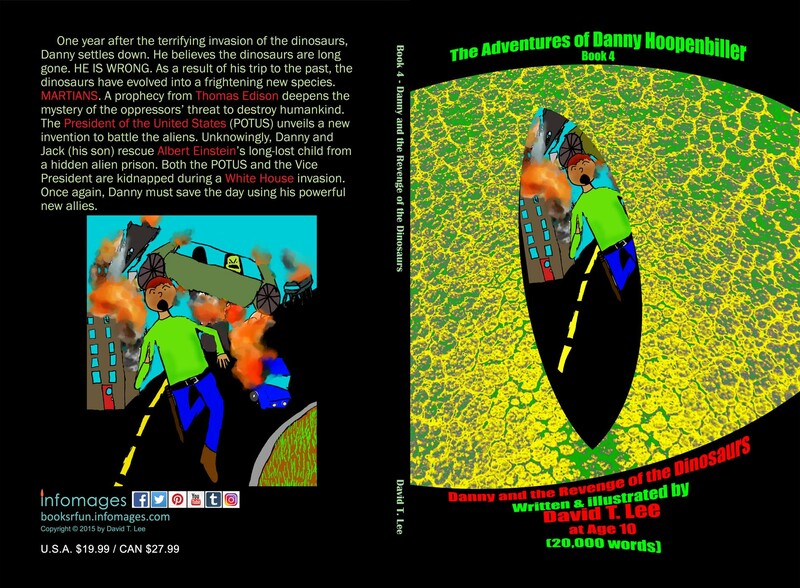 Traveling through time, portals and wormholes, Danny teams up with a colorful cast of allies (e.g. POTUS, US Army, NASA, Albert Einstein’s long lost daughter Lieserl, the Havocker brothers and his family) for adventures ranging from an exploration beyond the solar system to high-stakes battles against otherworldly adversaries such as Martians, dinosaurs and Dinozillas! 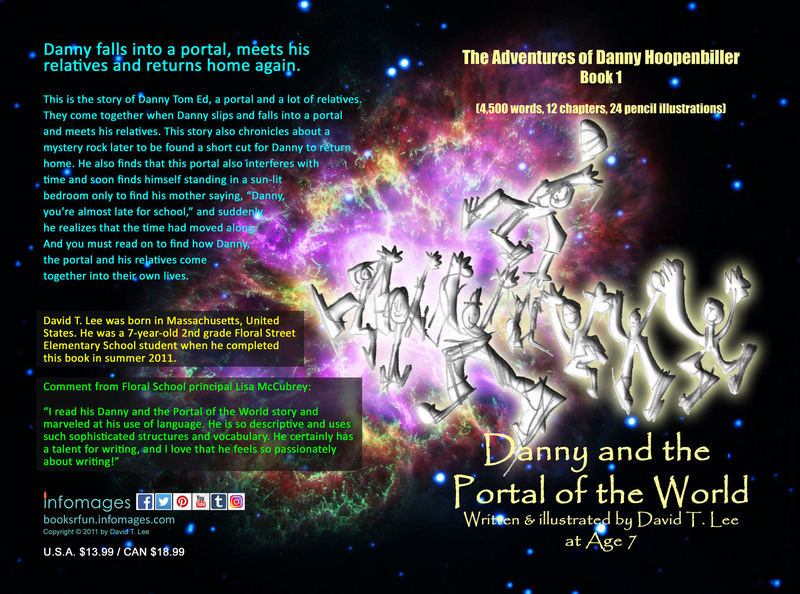 Danny falls into a portal, meets his relatives and returns home again. This is the story of Danny Tom Ed, a portal and a lot of relatives. They come together when Danny slips and falls into a portal and meets his relatives. This story also chronicles about a mystery rock later to be found a short cut for Danny to return home. He also finds that this portal also interferes with time and soon finds himself standing in a sun-lit bedroom only to find his mother saying, “Danny, you’re almost late for school,” and suddenly he realizes that the time had moved along. And you must read on to find how Danny, the portal and his relatives come together into their own lives. The story starts when Danny accidentally spills soda on one of his birthday gifts, a RC plane, and it enlarges enough so it could fit Danny’s whole family inside it. Unfortunately, Danny’s house is destroyed when the machine starts up and the family decides to travel to Massachusetts (from England). On the way, they run into Grandpa Garth’s plane and all of Danny’s relatives join Danny’s family. Two hours later, after a nap, Danny finds out that the spacecraft has flown through the atmosphere and they have entered outer space. They land on the Moon and have a fun time there. When they come back to their spacecraft, 100 Martian Spacebattlers attack the spacecraft. The only way Danny and his passengers could survive the attack was to fire their own cannons. They eventually win the battle and head on farther from Earth and more into outer space. Later, they go through a wormhole and meet a few oddities there, like another Earth with a hotel and a strange planet where most of it is made out of food. And you must read on to see how Danny’s experience comes together while traveling through the dangers and mystifications of outer space. The impossible has happened. Dinosaurs, vanished 65 million years ago, have come back to life. Nations have to unite to stop the rampaging monsters from wiping out mankind. Humans are losing the fight – until Danny Hoopenbiller comes. After dinosaurs destroyed his home, Danny is forced to protect his family and under desperate measures, leads the USA Army into what may be their most deadly mission. Danny is the balance that could either save or raze humankind. Will he survive? One year after the terrifying invasion of the dinosaurs, Danny settles down. He believes the dinosaurs are long gone. HE IS WRONG. As a result of his trip to the past, the dinosaurs have evolved into a frightening new species. MARTIANS. A prophecy from Thomas Edison deepens the mystery of the oppressors’ threat to destroy humankind. The President of the United States (POTUS) unveils a new invention to battle the aliens. Unknowingly, Danny and Jack (his son) rescue Albert Einstein’s long-lost child from a hidden alien prison. Both the POTUS and the Vice President are kidnapped during a White House invasion. Once again, Danny must save the day using his powerful new allies. Danny Hoopenbiller and the rest of humanity are in DOUBLE TROUBLE. Fighting the MARTIANS was bad enough. Now DINOZILLAS – a species of enormous, mutated dinosaurs – have erupted from the ground to wreak their vengeance against mankind. 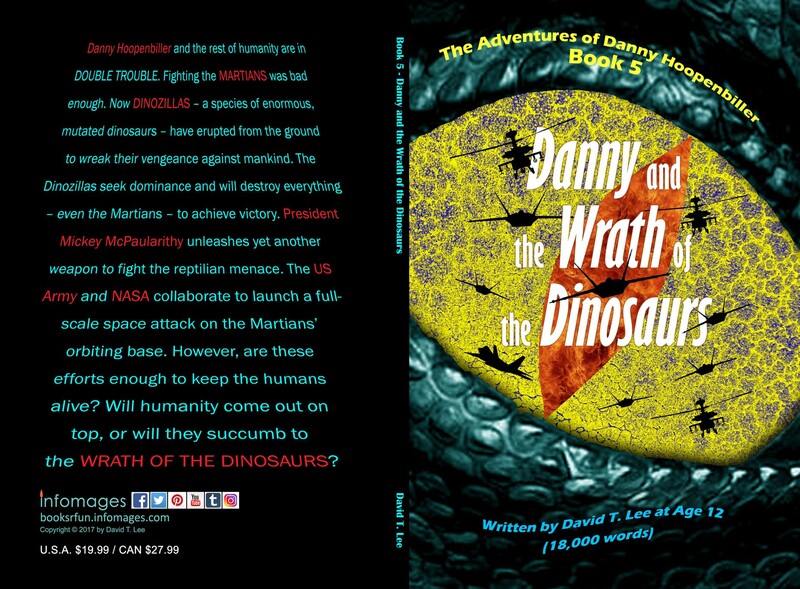 The Dinozillas seek dominance and will destroy everything – even the Martians – to achieve victory. President Mickey McPaularithy unleashes yet another weapon to fight the reptilian menace. The US Army and NASA collaborate to launch a full-scale space attack on the Martians’ orbiting base. However, are these efforts enough to keep the humans alive? Will humanity come out on top, or will they succumb to the WRATH OF THE DINOSAURS?